Journal : Australian Medical Journal ; n. s., vol. viii. Melbourne : Stillwell and Co., 1886. Description : 534-552 p. [1 l. pl.] ; ill.: 1 phot., 4 tbls. ; 23 cm. Photograph : representation of the specimen. Subject : Ovaries — Cystic tumors; ovariotomy. Author caption: By W. BALLS-HEADLEY M.A. M.D. Cantab., M.R.C.P.L. President, Medical Society of Victoria, 1889. President, obstetrics and gynaecology section, Intercolonial Medical Congress in Sydney, 1892. Vice-president, British Gynaecological Society of London, 1897-1898. Includes several histories of Porro's operation. Cited: (1887), Lancet, Lond. : v. ii; pp. 1008, 1056. Abridged offprint: (1886), First Poro-Caesarean operation (the foetus being viable) in Australasia. Index Medicus: 11002671650, 20100411180, 20200751310 (offprint). The seventh report titled, Case of Porro's Operation on a Ricketty Dwarf–Recovery, was the first successful cæsarian performed at Women's Hospital in Melbourne and the second for all of Australia. 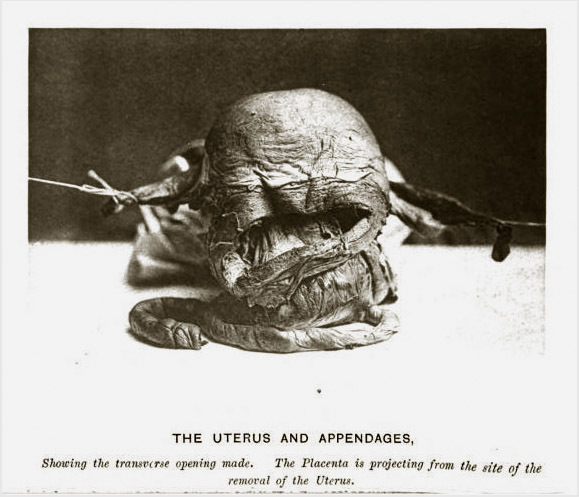 Porro's operation for cæsarian included excision of the uterus and ovaries as can be seen in the photograph. Doctor Balls-Headley provides an excellent historical review of the procedure. In 1888 he issued another report titled, A second series of seven cases of laparotomy.